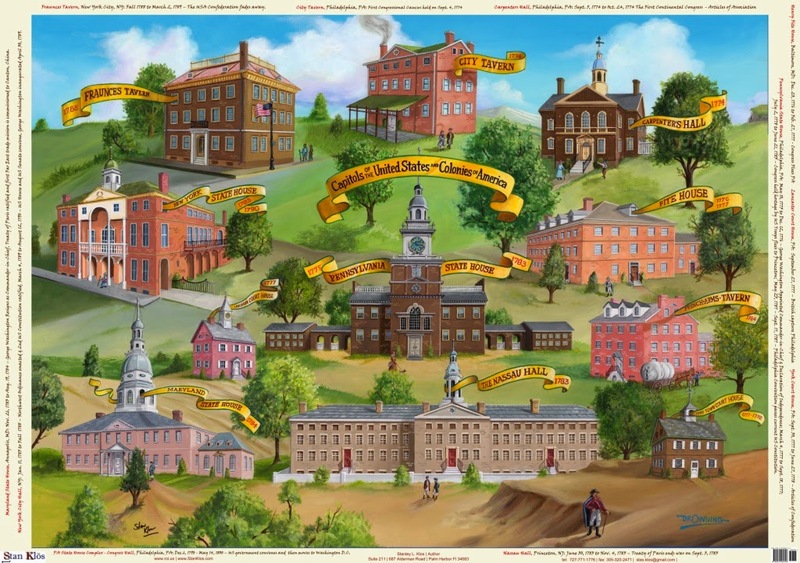 The United Colonies and States of America has had nine cities or towns that served as their seats of government.1 Commonly referred to as "Capitals," the Congresses of the United Colonies and States of America actually convened in 18 different buildings from September 5, 1774 to present. What follows is a brief history on each of the United Colonial and States Congressional Seats of Government during the U.S. founding period. First United American Republic: United Colonies of North America: 13 British Colonies United in Congress was founded by 12 colonies on September 5th, 1774 (Georgia joined in 1775) and governed through a British Colonial Continental Congress. Peyton Randolph and George Washington served, respectively, as the Republic's first President and Commander-in-Chief. 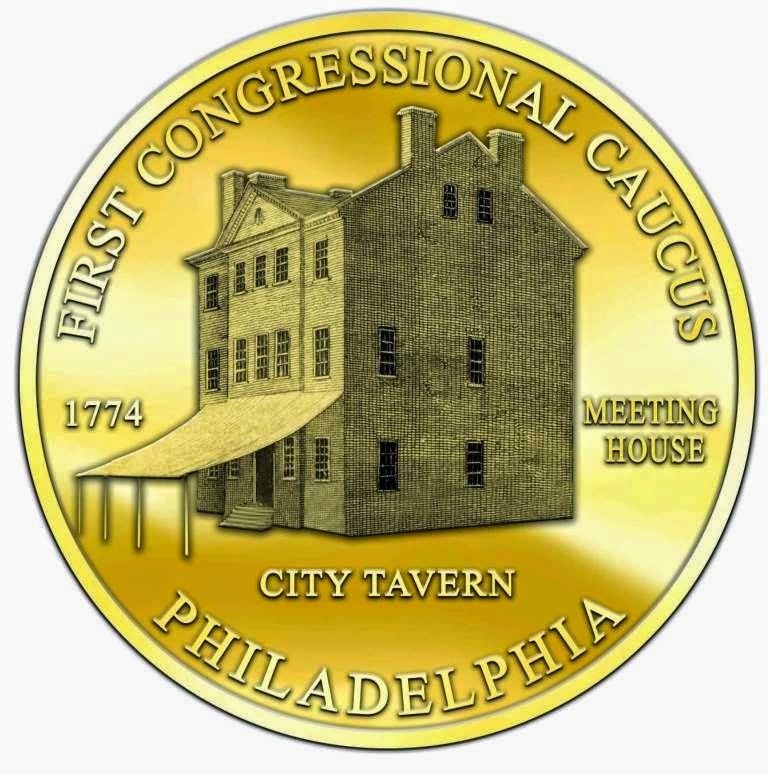 The City Tavern was located at 138 South 2nd Street, at the intersection of Second and Walnut Streets of Philadelphia, Pennsylvania. Delegate John Adams referred to the City Tavern in Philadelphia as the "most genteel tavern in America." It was commissioned by the Social Elite as the Merchants' Coffee House in 1773. This Federal brick structure was utilized as a Tavern until it was badly damaged by a fire in 1834. City Tavern was rebuilt to its original floor plan in the 1970’s for the Bicentennial and currently functions as tavern and restaurant owned by the United States Department of Interior. *Smith, Paul H., et al., eds. Letters of Delegates to Congress, 1774-1789. 25 volumes, Washington, D.C.: Library of Congress, 1976-2000). 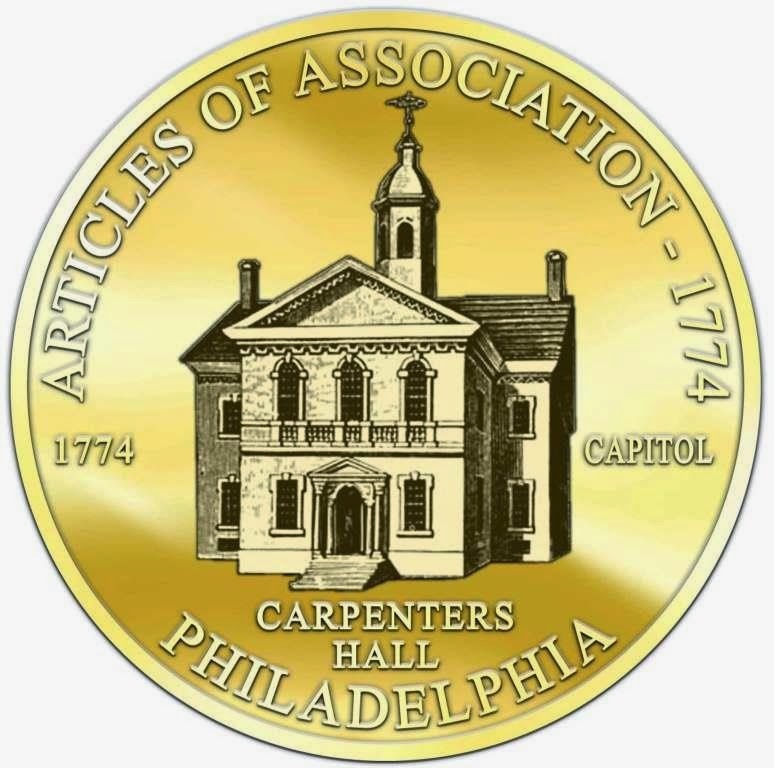 Carpenters’ Hall is located in Philadelphia, Pennsylvania. It was built as a four-story Georgian Colonial brick building between 1770 and 1773 by the Carpenters’ Company. Designed by architect Robert Smith (1722-1777), the structure was declared a United States National Historic Landmark in 1970. The building is still utilized as a meeting place for the Carpenters' Company. It was in Carpenters’ Hall that the United Colonies Continental Congress first convened and founded the First United American Republic. Pennsylvania State House is located on Chestnut Street between 5th and 6th Streets in Philadelphia. Now known as Independence Hall, this red brick building was built between 1732 and 1753 as the colonial seat for the Province of Pennsylvania. Edmund Woolley, the builder, designed the building with Andrew Hamilton in its distinctive Georgian style. Two smaller buildings were added in the construction with City Hall to the east and Congress Hall to the west. The United Colonies Continental Congress first convened here on May 10th, 1775. Second United American Republic: The United States of America: 13 Independent States United in Congress was founded by 12 states on July 2nd, 1776 (New York abstained until July 9th), and governed through the United States Continental Congress. John Hancock and George Washington served, respectively, as the Republic's first President and Commander-in-Chief. 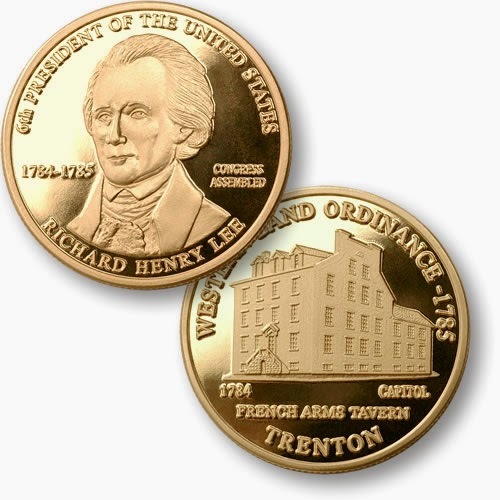 After General Washington’s victories at Trenton and Princeton, the British re-fortified their lines in New Jersey and abandoned their plans to occupy Philadelphia. 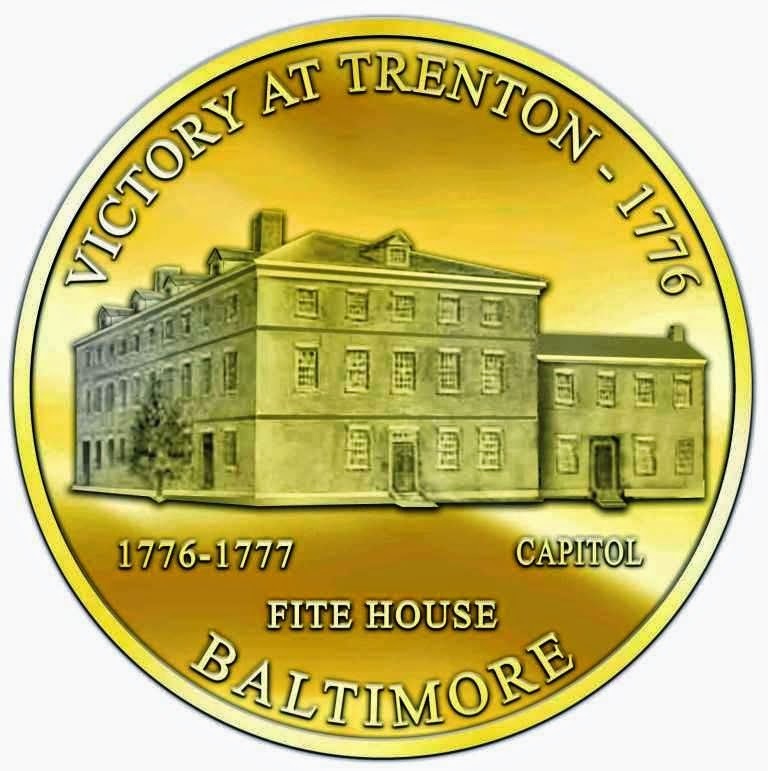 A road weary Continental Congress returned to the Pennsylvania State House on March 4, 1777. Lancaster Court House was a 1730 brick structure, 30’ x 30’, that had a brick pavement floor. The Court House was crowned with a small spire that had a clock of two faces, one for the south and the other for the north. 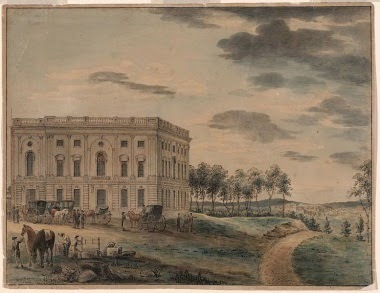 The structure burnt down in 1781 and was replaced with a much larger structure in 1785 that is often depicted, incorrectly, as the Continental Congress Capitol building. 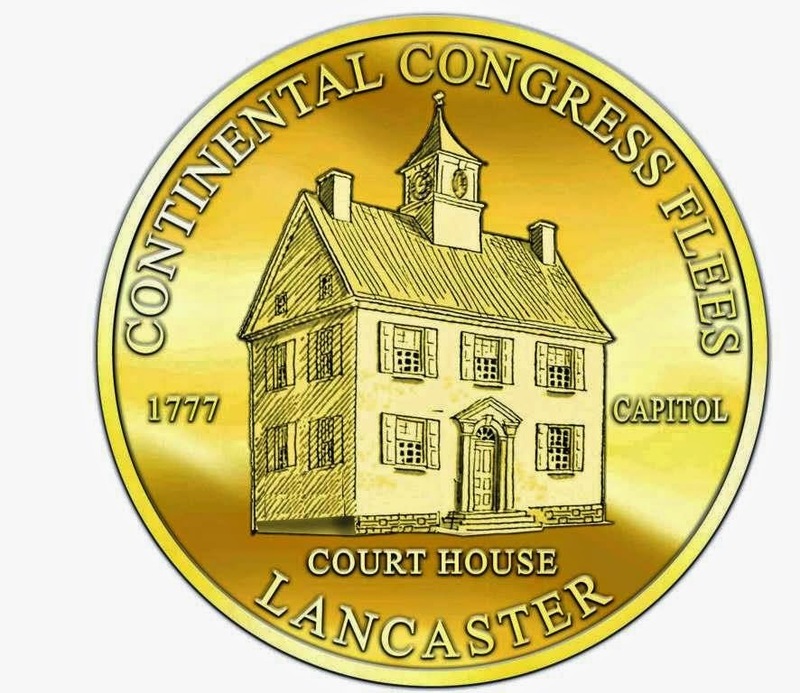 Upon their arrival on September 27, 1777, the Continental Congress convened but was forced to vacate the building the following day. The Pennsylvania officials, who had also fled Philadelphia, required the meeting space for the use of their State government business. York-Town Court House was constructed by William Willis in 1756 and stood in the "Centre Square" of two 80' thoroughfares. The 45’ x 45’ Georgian Brick Colonial Court House stood in the Center of West Market Street until 1841. In this Court House the Delegates received notice of Washington’s loss at Brandywine, Burgoyne’s surrender at Saratoga, Franklin’s success in achieving an alliance with France and the struggles of the Continental Army in Valley Forge. Also in this building the delegates hammered out and passed the Constitution of 1777, better known as the Articles of Confederation. 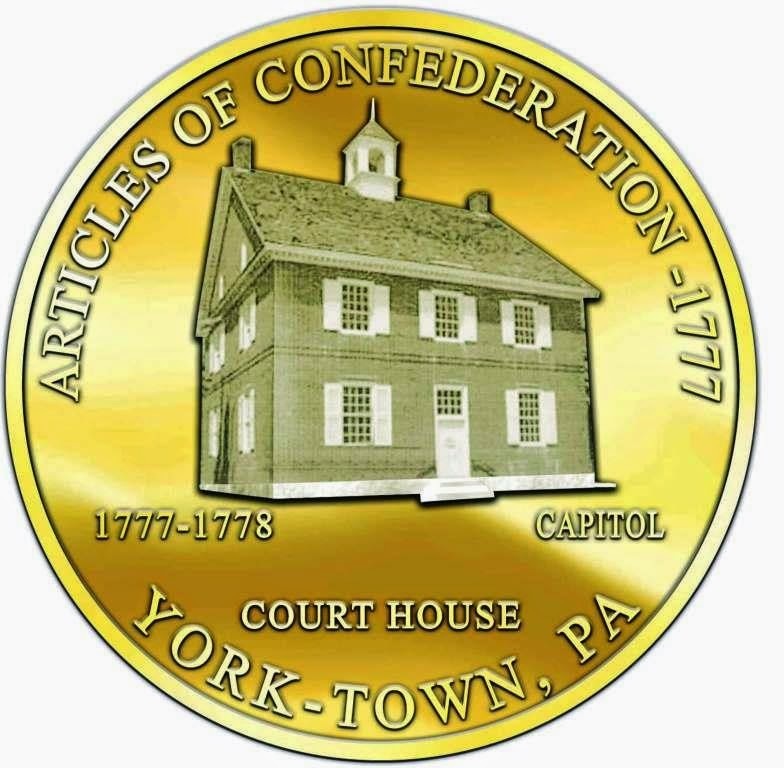 A replica of the Court House was built in 1976 by the York County Bicentennial Commission; it stands in a small colonial park at the intersection of West Market Street and the Codorus Creek. When Franklin was told that Sir William Howe had taken Philadelphia, his answer was that it was more likely that Philadelphia had taken Sir William Howe. There can be now no question that the stay of the British army in Philadelphia in the winter and spring of 1778 was damaging to the British cause. During this occupation seven hundred of the private soldiers deserted; while the conduct of the officers was marked by a luxury in singular contrast with the stern endurance of excessive hardships shown by Washington and those who served under him at Valley Forge. 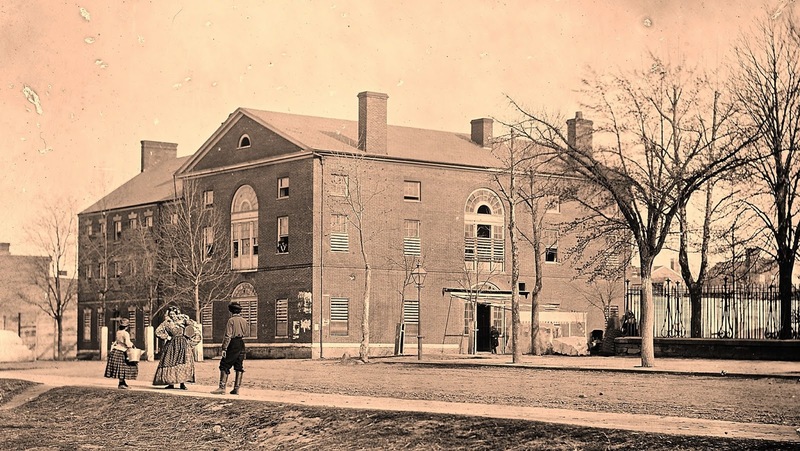 The Congress meets in the College Hall, as the State House was left by the enemy in a most filthy and sordid situation, as were many of the public and private buildings in the City. Some of the genteel houses were used for stables and holes cut in the parlor floors and their dung shoveled into the cellars. The country Northward of the City for several miles is one common waste, the houses burnt, the fruit trees and others cut down and carried off, fences carried away gardens and orchards destroyed. Mr. Dickenson's and Mr. Morris' fine seats all demolished-in short I could hardly find the great roads that used to pass that way. The enemy built a strong abattee with the fruit and other trees from the Delaware to Schuylkill and at about 40 or 50 rods distance along the abattue a quadrangular fort for cannon and a number of redoubts for small arms; the same on the several eminences along the Schuylkill against the City. 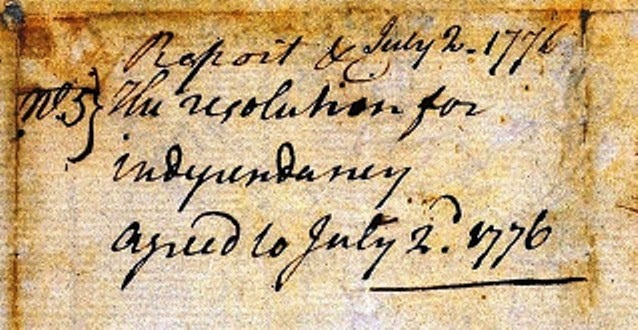 JCC, 1774-1789, Journals of the Continental Congress, June 25th, 1778. 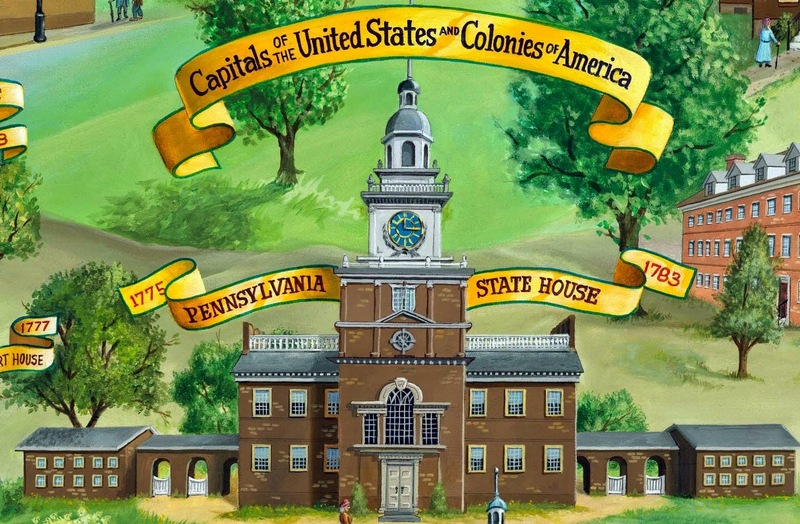 By July 19, 1778 the Pennsylvania State House was put into good repair enabling both the United States Continental Congress and the Pennsylvania Supreme Council to meet as their members mandated. Edmund Cody Burnett, , Letters Of Members Of The Continental Congress, The Carnegie institution of Washington, 1926, p. 333. 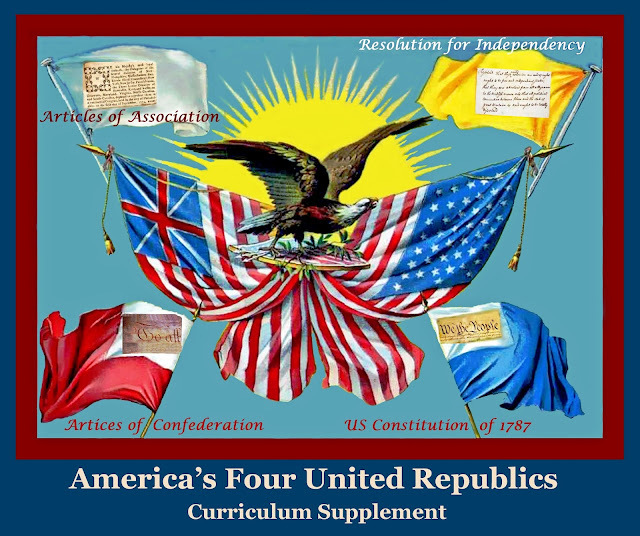 Third United American Republic: The United States of America: A Perpetual Union was founded by 13 States on March 1st, 1781, with the enactment of the first U.S. Constitution, the Articles of Confederation, and governed through the United States in Congress Assembled. 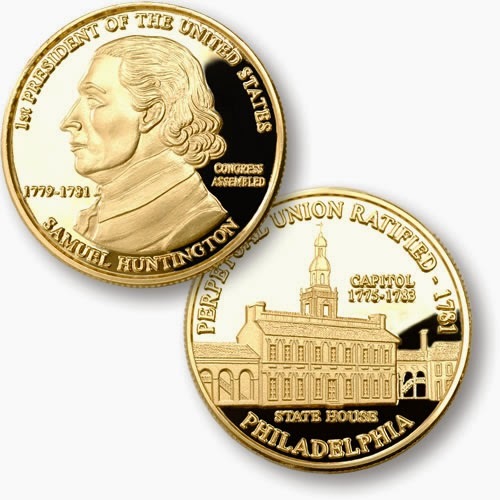 Samuel Huntington and George Washington served, respectively, as the Republic's first President and Commander-in-Chief. Articles of Confederation and perpetual Union between the states of New Hampshire, Massachusetts-bay, Rhode Island and Providence Plantations, Connecticut, New York, New Jersey, Pennsylvania, Delaware, Maryland, Virginia, North Carolina, South Carolina and Georgia." I. The Stile of this Confederacy shall be The United States of America. This date marked the birth of the Third United America Republic: The United States of America, A Not Quite Perpetual Union. The evidence favoring the view that “Prospect” was the scene of the opening meetings is more compelling in its strength. Congress had come to Princeton hastily and apparently without making any effort to ascertain definitely the practical accommodations of the village. Mr. Boudinot may have had Nassau Hall in his mind as a meeting place at the outset; but when Colonel Morgan, who was well acquainted in Congress, stated in his letter of the 25th that one of his buildings contained “a better room for them to meet in” than the members could be “immediately accommodated with elsewhere.” Mr. Boudinot probably accepted the offer as at least a temporary arrangement. Furthermore in the list of available accommodations issued in October by the citizens of Princeton, Colonel Morgan announces his willingness to have “the Congress Room” in his house fitted up for winter use if desired. It is difficult to explain this designation of any room at “Prospect” unless a previous occupation of it by Congress had given it a right to that title. Finally it is noted in a memorandum book of Charles Thomson, Secretary of Congress, that the sheet of paper bearing the record of the distribution of ten sets of the Journal was lost “in removing the Office from the House of Col. Morgan to the College.” Unfortunately, this record is dated merely “1783;” but when half of the rooms in Nassau Hall were vacant it is altogether improbable, considering the close relation existing between the Secretary of Congress and that body itself, that he should have used Colonel Morgan's house as an office if Congress were sitting in Nassau Hall. It is easier to believe that he moved his belongings over to the college building because Congress was moving also. We may, then, take it for granted that the first three meetings (June 30th, July 1st and 2d) were held in Colonel Morgan's house and that thereafter the sessions were held in the college building, in the library room presumably, except on state occasions, when they were held in the prayer-hall. The library-room which had been stripped by the British was on the north side of the second floor over the main entrance, and was about thirty by twenty-four feet in size. Prospect House owes its name to the stone farmhouse first constructed on the site in the mid-18th century by Colonel George Morgan, western explorer, U.S. Agent for Indian Affairs and gentleman farmer. The superb eastern view from that farmhouse prompted Colonel Morgan to name his estate "Prospect." 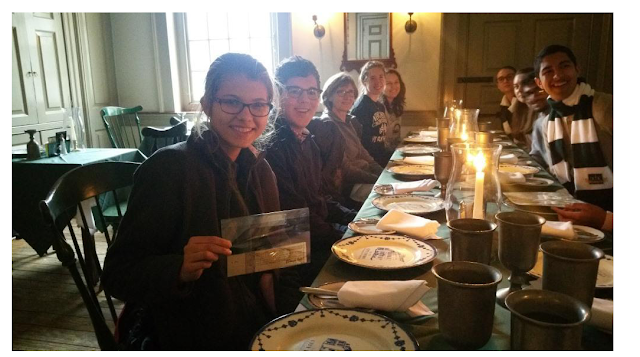 Morgan’s estate, a popular stopping off place in Revolutionary times, was visited by such diverse groups as a delegation of Delaware Indians, 2,000 mutinous soldiers of the Pennsylvania Line and the Continental Congress. When Prospect was acquired in 1849 by John Potter, a wealthy merchant from Charleston, S.C., he replaced the colonial structure with the present mansion. A letter from USCA Secretary Charles Thomson to Hannah Thomson, June 30, 1783, indicates that this is incorrect. Prospect House has thus been dismissed as a building utilized to convene the United States in Congress Assembled. Varnum Lansing Collins, , The Continental Congress at Princeton. The University library, 1908, pp. 57-58. 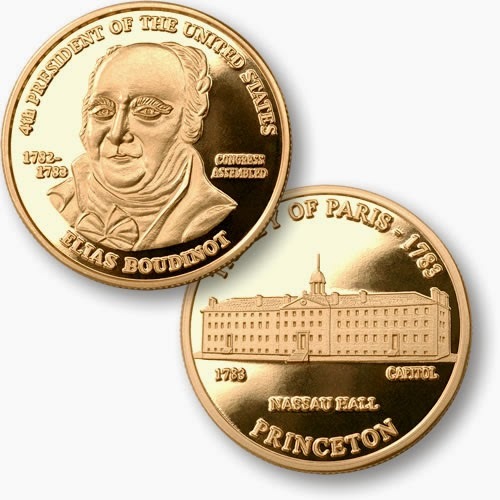 Princeton University, Prospect House History, http://www.princeton.edu/prospecthouse/history.html, March 15, 2012.
 Letters of Delegates to Congress, Smith, Paul H., et al., eds. Letters of Delegates to Congress, 1774-1789. 25 volumes, Washington, D.C.: Library of Congress, 1976-2000). Charles Thomson to Hannah Thomson, June 30. 1783. There are three flat-arched doors on the north side giving access by a flight of steps to the three separate entries (an entry refers here to the hallway on each floor running the full length of the building). At the center is a projecting section of five bays surmounted by a pediment with circular windows, and other decorations. The only ornamental feature above the cornice, is the cupola, standing somewhat higher than the twelve fireplace chimneys. Beyond these there are no features of distinction. The simple interior design is shown in the plan, where a central corridor provided communication with the students' chambers and recitation rooms, the entrances, and the common prayer hall; and on the second floor, with the library over the central north entrance. The prayer hall was two stories high, measured 32 by 40 feet, and had a balcony at the north end which could be reached from the second-story entry. Partially below ground level, though dimly lighted by windows, was the cellar, which served as kitchen, dining area (beneath the prayer hall), and storeroom. In all there were probably forty rooms for the students, not including those added later in the cellar when a moat was dug to allow additional light and air into that dungeon. Later, the USCA regular sessions met in Nassau Hall’s library room, which was located over the front entrance. For official dignitary occasions, it adjourned to the chapel on the main floor. 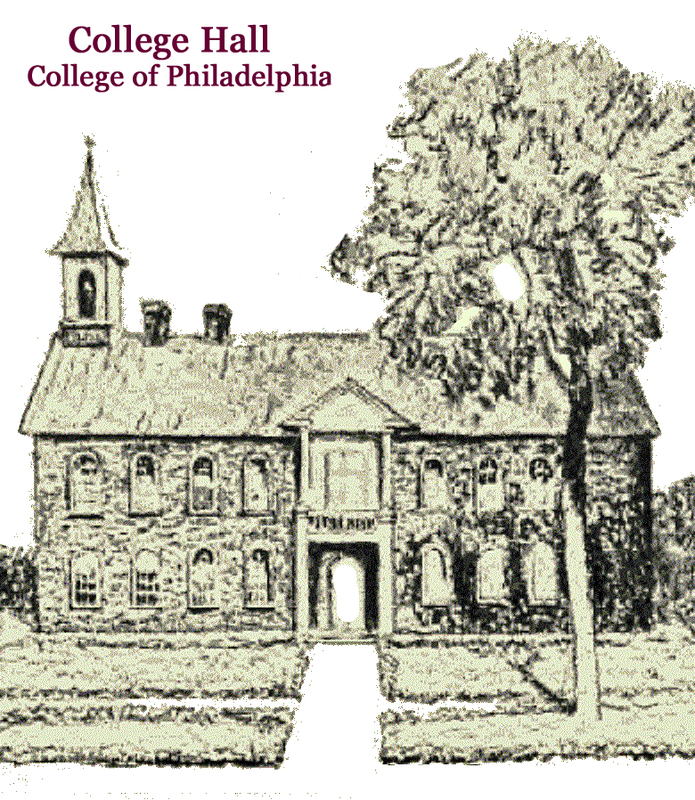 The move of the capital from Philadelphia to the College of New Jersey was a boom for the Princeton economy. Henry L Savage,., ed., Nassau Halls, 1756-1956, Princeton: Princeton University Press,, 1956. .
 Collins, op.cit., p. 57 references a letter of Ashbel Green, a senior in college, to his father, July 5th, 1783 cited in H. C. Alexander, Life of J. A. Alexander (1870), Vol. I, p. 16, as well as the Independent Gazeteer of November 1st, 1783. The Maryland State House was designed by Joseph Horatio Anderson in 1771. Its construction began in 1772 but was not completed until 1779 due to the struggle for Independence. The building was constructed in red brick Georgian style with a small portico projecting out from the center crowned by a pediment. The State House entrance is accented with two high arched windows that complement the large rectangular windows on both stories lining the façade. A cornice above the windows is topped by another pediment and the sloping roof gives way for a central octagonal drum atop which rests a distinctive dome. The great dome is topped by a balustrade balcony, another octagonal drum and a lantern. The Interior of the Dome, from floor to ceiling, is 113' with the building itself encompassing 120,900 square feet under roof. It is the oldest American State Capitol still in continuous legislative use. Here on February 2, 1781, the Maryland legislature ratified the Articles of Confederation thus dissolving the old U.S. Continental Congress government. The USCA assembled in the French Arms Tavern that was erected in 1730 as a private residence of stone and stucco. The building was two stories high, with a gabled roof that measuring 45 feet in width and 43 feet in depth plus a narrower extension in the rear. The house stood on the southwest corner of King (now Warren) Street and Second (now State) Street in Trenton, New Jersey. The rear extension on the Second Street side served as kitchen and servant's quarters. The building was owned by John Dagworthy until his death in 1756. For two years during this period, from 1740 to 1742, it was the official residence of Governor Lewis Morris. In 1760 it was sold to Samuel Henry, an iron manufacturer, who made it his residence until he leased the property to Jacob G. Bergen in 1780 for use as a tavern. Before opening the tavern, which he named "Thirteen Stars," Bergen made extensive changes in the building. He added a third story, with a gabled, dormer-windowed roof; converted two of the first-floor rooms into one room 20 feet in width and 43 feet in length, which became known as the "Long Room;" and set up a barroom in the basement. In 1783 the building was described as a "Dwelling-house 45 by 43 Feet, 3 Stories, 11 Rooms, eight with Fireplaces, a Kitchen and Stabling for 12 Horses." The Building’s name later changed to the French Arms celebrating France’s role in the defeat of Cornwallis at Yorktown when John Cape took over the tavern’s management. Bergen returned to the tavern in 1783 and retained the French Arms name. 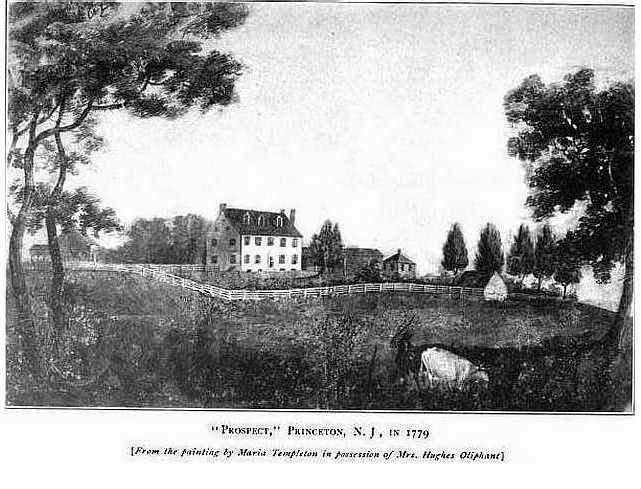 In 1784 a commission appointed by the New Jersey Legislature leased the tavern, which was still the largest building in town, for the use of the USCA. The Long room walls were repapered, the floors were carpeted and a platform erected in the center of the south side of the room between the two fireplaces. Thirteen new tables covered with green cloth and forty-eight new Windsor chairs were provided for the delegates. The USCA stay at Trenton was brief and most of its time was spent in appealing to the states to send delegates. Godfrey, The Mechanics Bank, pp. 25-6. Old New York City Hall, the capitol building that housed the USCA was eighty-five years old in 1785. In January, 1698, a committee was appointed to report on the necessity of a new building for New York’s governmental offices. A new structure was recommended at a site “opposite the upper end of Broad St.” The committee contracted James Evetts and his subsequent design was presented and approved by the colonial government. To fund the construction, the old city hall, “excluding the bell, the King's arms, and the iron-work belonging to the prison,” were sold at public auction to a merchant, John Hodman, for the sum of £920. The cage, pillory, and stocks, however, remained in front of the old building for a year afterwards while the new structure was being built. The foundation stone of the building was laid, with some ceremony, in August 1699 as evidenced by a warrant drawn for paying the expense incurred on that occasion. March 1700 records indicate the Colonial Common Council contracted with William Mumford to carve the King's, Colonial Governor Lord Bellamont’s and Lieutenant-Governor, Captain Nanfan’s arms of the size of the three blank squares left in the front of the City Hall for that purpose. Moldings of stone were required to be made around each coat-of-arms, each to be cut on one stone, unless a stone sufficiently large for the King's arms could not be procured, in which case two stones might be used. The contract called from them to be completed within six months and Mumford was to receive forty-one pounds four shillings. The building, thus, was completed in late 1700 or early 1701, although the exact date is unknown. In 1703, the cage, pillory, whipping-post, and stocks were removed from Coenties slip and erected in the upper end of Broad Street, a little below the New City Hall. 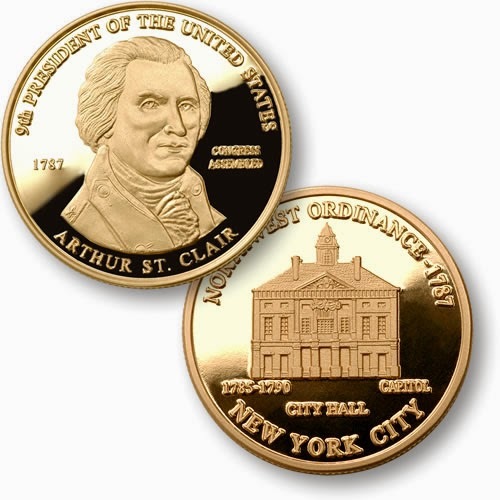 In 1715, Mr. Stephen Delancy, a “liberal and wealthy merchant”, presented the city with fifty pounds, which he had received as his salary as representative of the city in the General Assembly. He suggested, after being asked, that the funds be used to purchase of a clock, to be placed in the cupola of the City Hall. In 1716 an agreement was accordingly made with clockmaker Joseph Phillips for its construction. It was provided, that the largest wheel of the clock should be nine inches in diameter, and that there should be two dial-plates of red cedar, painted and gilt, each to be six feet square. The price paid was sixty-five pounds. It was not until the year 1718 that the balcony called for in the original plans was constructed. In 1738 it was found that the cupola of this building was ''very rotten and in danger of falling." The old cupola was dismantled and a new one of the same specification was erected in its place. First Floor of New York City Hall before it was converted into Federal Hall in 1785. Federal Hall would serve as the capitol of the United States of America from January 11, 1785 to October 6, 1788 and again after renovations for the new tripartite government from March 4, 1789 to August 12, 1790. In 1763, which was a period when improvements, both private and public, were greatly encouraged in the city, the City Hall, now 63 three years old, was altered and improved, at very considerable expense. The colonial committee of the Common Council approved a plan of "alterations and ornaments '' to the building and to defray the computed cost of three thousand pounds, a lottery was established. Among other improvements, the building was made higher, and roofed with copper procured from England. The balcony in the front of the building was extended out to range with the two wings. A cupola of more imposing dimensions was raised upon the building, along with a bell of larger dimensions than the old one. Second Floor of New York City Hall before it was converted into Federal Hall in 1785. 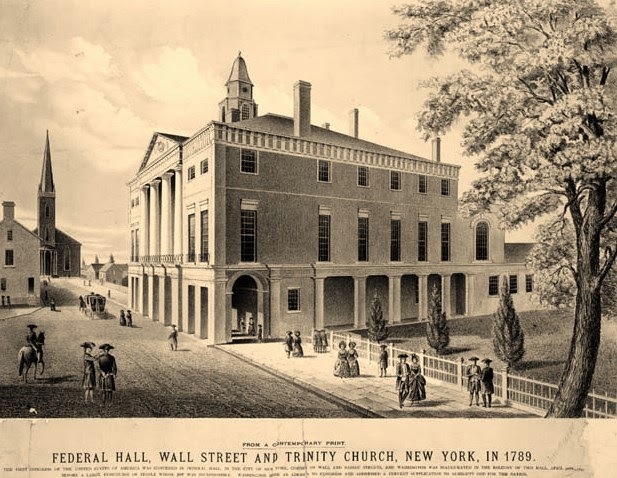 Federal Hall would serve as the capitol of the United States of America from January 11, 1785 to October 6, 1788 and again after renovations for the new tripartite government from March 4, 1789 to August 12, 1790. Third Floor of New York City Hall before it was converted into Federal Hall in 1785. Federal Hall would serve as the capitol of the United States of America from January 11, 1785 to October 6, 1788 and again after renovations for the new tripartite government from March 4, 1789 to August 12, 1790. 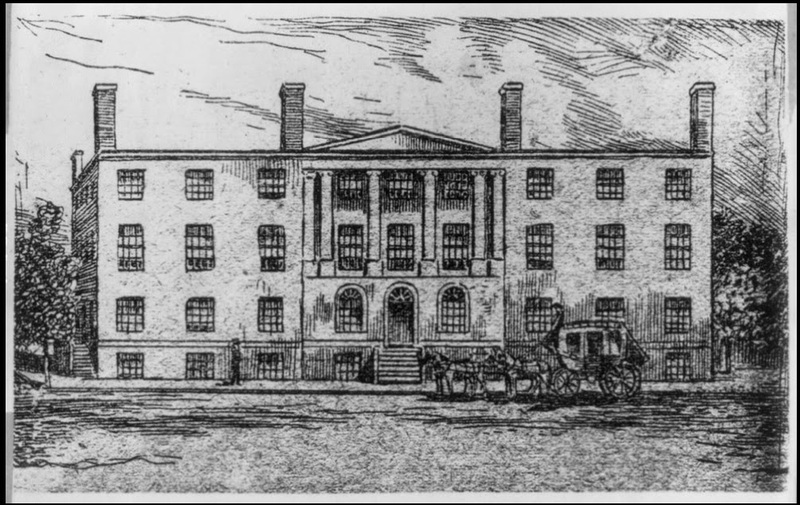 In January of 1785, the USCA conducted their meetings on the second floor which was once the room of the NY Supreme Court. A room adjoining the meeting room was still occupied “and the noise of the scholars in their recitations was so annoying as to disturb the debates. Complaint being made of this, the school was discontinued.”  This building would be the site where both the Northwest Ordinance and the Constitution of 1787 would be hotly debated with the former being enacted and the latter being sent on to the states, unchanged, for ratification. Coenties Slip was an artificial inlet in the East River for the loading and unloading of ships that was land-filled in 1835. New York's first City Hall once stood at Coenties Alley and Pearl Street, just to the north of Coenties Slip. In is now a historic pedestrian walkway. Willis, Samuel et al, NYC Manual, p. 541. History.com - 8 Forgotten Capitals of the United States, July 16, 2015 By Christopher Klein (retrived August 2, 2017 - http://www.history.com/news/8-forgotten-capitals-of-the-united-states ). US Senate - Chronological Table of the Capitals (retrieved August 2, 2017 from https://www.senate.gov/reference/reference_item/Nine_Capitals_of_the_United_States.htm). Wikipedia - List of capitals in the United States, (retrieved August 2, 2017 from https://en.wikipedia.org/wiki/List_of_capitals_in_the_United_States). The confusion over the October 1788, Seat of Government relocation stems from the Department of Foreign Affairs May 1st, 1788, move from Fraunces Tavern to Walter Livingston's house at 95 Broadway. The Federal Hall building stood on the corner of Nassau and Wall Streets until 1812 when it was razed. It was remodeled and enlarged in 1788 and 1789 preparing for the new tripartite government under the direction of Pierre Charles L'Enfant. This was the first example of Federal Style architecture in the United States. It was renamed Federal Hall when it became the first Capitol of the United States under the Constitution of 1787. L'Enfant would be later selected by George Washington to design the capital city on the Potomac River in Maryland. Congress Hall is located on the corner of Chestnut and 6th Streets and was originally built to serve as the Philadelphia County Courthouse. It was designed by architect Samuel Lewis and construction began in 1787 and completed in 1789. 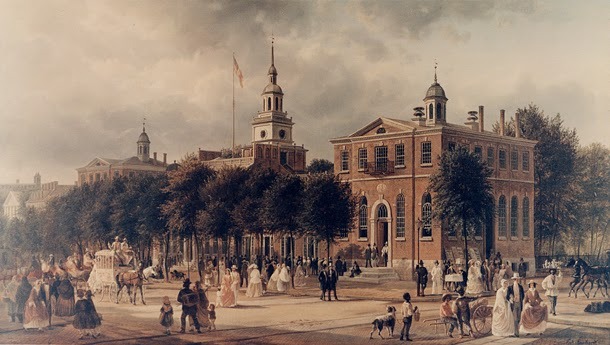 The US Congress, assembled in New York's Federal Hall, passed the An Act for establishing the temporary and permanent seat of the Government of the United States, which established a temporary U.S. Capital in Philadelphia from 1790 - 1800. It was signed into law by President George Washington on July 16th, 1790. The new Courthouse, consequently, served as the meeting place of the U. S. Congress from December 6, 1790 to May 14, 1800 with the House of Representatives meeting on the main floor, while the Senate assembled upstairs. 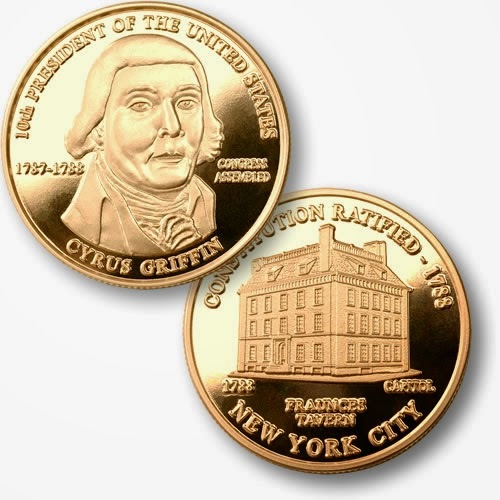 Among the historic events that took place here were the presidential inaugurations of George Washington (his second) and John Adams; the establishment of the First Bank of the United States, the Federal Mint, and the Department of the Navy; and the ratification of Jay's Treaty with England. During the 19th century, the building was used by Federal and local courts. The building, inside and out, has been restored as much as possible to the period of time when the building was the U.S. Capitol. Blodgett’s Hotel, at Seventh and E Streets Northwest, never served its intended purpose as a guesthouse. Congress authorized the purchase of the unfinished building in 1810 for federal offices and used it as temporary quarters in 1814 after the Capitol was burned. The U.S. Capitol Building is located in Washington, D.C., at the eastern end of the National Mall on a plateau just under 90 feet above the level of the Potomac River. The site commands a westward view across the Capitol Reflecting Pool to the Washington Monument 1.4 miles away and the Lincoln Memorial 2.2 miles away. 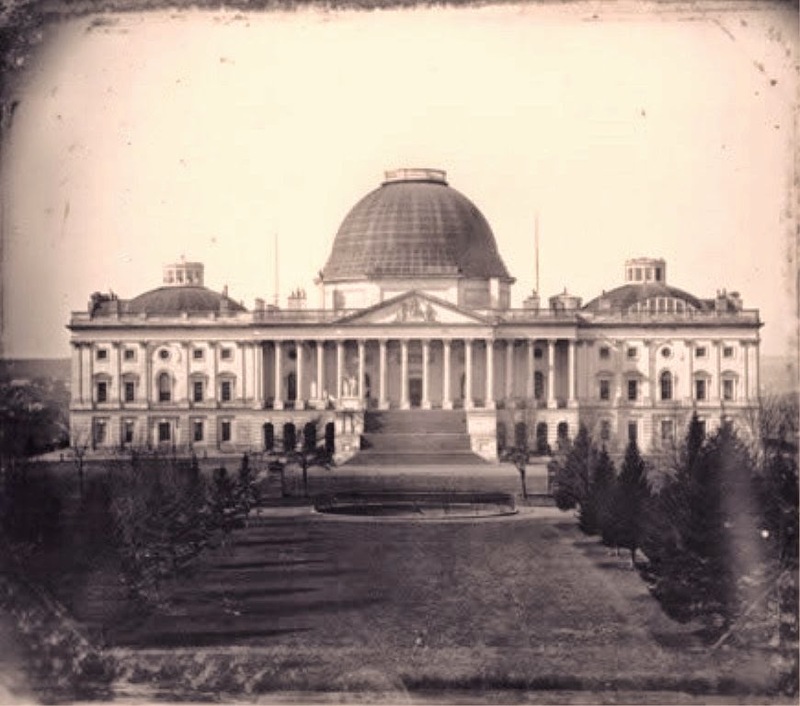 The earliest known photographic image of the U.S. Capitol, taken in 1846. credit: Library of Congress; photo by John Plumbe. The legislation enabling the federal capital to be permanently located in the District of Columbia was contentious. Article I, Section 8 of the Constitution (1787), which gave the Congress legislative authority over “such District (not exceeding ten Miles square) as may, by Cession of Particular States, and the Acceptance of Congress, become the Seat of the Government of the United States...” Treasury Secretary Alexander Hamilton was instrumental in brokering a compromise between the Southern and Northern States. The Southern States agreed that if the capital were located along the banks of the Potomac River they would permit the federal government to take on debt incurred during the American Revolutionary War. 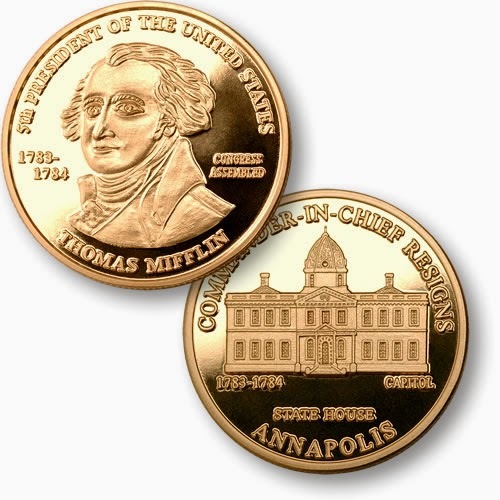 In 1788, the state of Maryland ceded to Congress "any district in this State, not exceeding ten miles square," and in 1789 the state of Virginia ceded an equivalent amount of land. In accordance with the "Residence Act" passed by Congress in 1790, President Washington in 1791 selected the area that is now the District of Columbia from the land ceded by Maryland (private landowners whose property fell within this area were compensated by a payment of £25 per acre); that ceded by Virginia was not used for the capital and was returned to Virginia in 1846. Also under the provisions of that Act, he selected three Commissioners to survey the site and oversee the design and construction of the capital city and its government buildings. The Commissioners, in turn, selected the French engineer Pierre Charles L'Enfant to plan the new city of Washington. L'Enfant's plan, which was influenced by the gardens at Versailles, arranged the city's streets and avenues in a grid overlaid with baroque diagonals; the result is a functional and aesthetic whole in which government buildings are balanced against public lawns, gardens, squares, and paths. 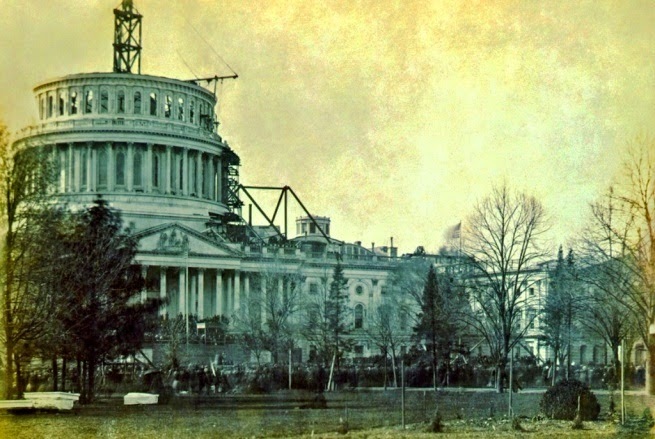 The Capitol itself was located at the elevated east end of the Mall, on the brow of what was then called Jenkins' Hill. The site was, in L'Enfant's words, "a pedestal waiting for a monument." 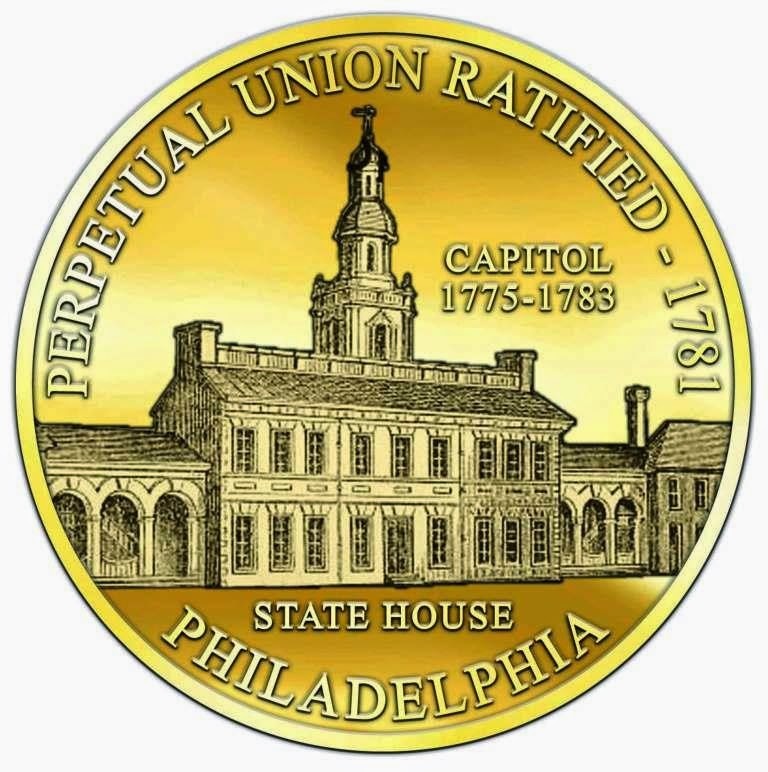 The legislation also included the establishment of Philadelphia as a temporary seat of government for ten years (1790-1800), until the nation's capital in Washington, D.C. would be ready. On December 19, 1960, the Capitol was declared a National Historic Landmark by the National Park Service.